Thanks for the post, Dawn. Can you please back up and define pH? What does that term mean in the context of hair? I HATED KCCC because of how gummy or hard it left my hair. But my hair remains supple and smooth when using it. I try other products but always come back to KC. Kimmaytube has a comparison video & states KCCC has a pH of 4.5. I look forward to reading the viewers recommendations! Dear Stephanie - pH stands for the latin phrase "per Hydronium". Water is known as H20 (two Hyrdrogens and one Oxgen) but these elements can also form as H30 or H0. H30 is known as Hydronium. When there is an equal balance of each form present, the liquid is considered pH balanced. That number is represented by pH 7. If a product has more Hydrogen ions present, it is considered more acidic, and the pH number dips lower. If something has fewer Hydrogen ions present, the pH number elevates higher and the product is considered alkaline. The pH of the stomach contents is lower than 4. It can be from 0 to 4, but averages pH 2. The stomach needs a pH below pH 4 to dissolve the food and release it's nutrients. 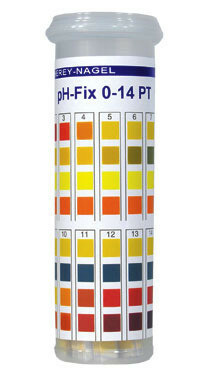 Any higher than pH 4, and the intestine will have nutritional absorption problems. As the dissolved food leaves the stomach, the pancreas and gallbladder release bile and bicarbonate to raise the pH to a neutral level (pH 7)so the intestine isn't eroded by the acidic stomach contents. I could go on and on, but you get the gist. pH is good when it's at the right pH level at the right time and right place. Actually checking the pH of my products is too much work for me. I'll just continue to surf the net and see the results of other people's tests. Do the skin products we use have to have a Ph of 4.5-5.5? I tried using raw african black soap but it started to break me out and dry my skin. I tested the ph not knowing what else to do. Its range is 10+. Since then I've stopped using it and have been trying to lower the Ph with natural ingredients (apple cider vinegar, aloe vera juice, lemon juice) but whenever I get it to a 4.4-4.5 range it looses the ability to clean and turns into a gooey mess. After making several different batches I finally got it down to about a 7/8. Should I use black soap on my skin? Help please. still tryna figure this one out...my apple cider vinegar rinse was a fail, i think i used too much; oh well time to read this article and then bak to the drawing board! I bought my strips from lotioncrafter, testing is easier than brushing your teeth and you only do it once. Staying between 4.5-5.5 for hair and skin has produced amazing results for me! My 4.5 hair and body mist formulation is a godsend and I follow it with my favorite oil or cream and voila! The results are deeply moisturized, supple and smooth hair and skin. My skin looks younger and my hair's natural definition and shine come out in ways I hadn't seen since my childhood when my mom knew more about this stuff. Even highly acidic ayurvedic powders which can be 3-3.5pH do wonderful things to my hair. Awareness of pH has also allowed me to cut my daily routine to a water rinse, leave-in and sealant job. I no longer need the products I would use to restore bounce and shine and pliability to my hair after stripping it with highly alkaline products. Anything above 7 dehydrates my skin and leaves my hair frayed and dry. I actually have fun amateur-testing things, it feels like I'm taking back control of the products I use in and on my body. I think it's important to note that hair porosity also plays a factor in choosing the PH of products. When I went natural, I bought a bunch of things that did not work for me. Aloe vera gel for example, turns my hair into a frizzy, sticky disaster. I attribute this to the fact that my hair is low porosity. It works wonders on my skin, however! Now, I do a lot of water rinses and skip the products many days. When I do shampoo/cleanse, I tend to use a product with a higher ph, then put on a deep conditioner in so my hair can absorb the moisture, finally I rinse with cold water and diluted vinegar to seal in the moisturizing effects. I do this about twice per month and it works for me. There is no one fits all strategy. Is there a key to this and making sure hair products have a ph balance between 4.5 - 5.5? Is that key that this concept applies to hair that is wet and not dry? The only conditioner that I'm aware that is pH balanced is Giovanni Direct Leave In and it has a pH of 4.5. I love it. It stretches my hair well, it keeps it shiny and moisturized for days, and it's a great DC and a great detangler. It's definitely my Holy Grail.